Make no mistake — a concerted effort by the mainstream corporate media is underway to undermine those who express peaceful dissent. A seemingly blatant attempt to discredit the alternative media by lumping independent publishers into a contrived category of ‘fake news’ has begun. Do not misunderstand this warning as a denial that fake news sites exist to intentionally mislead the public into believing a false narrative. There is certainly no shortage of ‘news’ websites that promote racism, disinformation, and general ignorance. However, whose job is it to filter through this sea of disinfo? Certainly not the disinformation agents in the mainstream media, right? Well, that is exactly what is happening. Just because sites like CNN, FOX News, MSNBC, Washington Post, HuffPost and the like use short titles that appear harmless on the surface, does not mean that they are not filled with propaganda — pushing racism, disinformation and ignorance. This week, multiple mainstream media sources across the web began reporting on a ‘list’ of ‘fake’ news sites. NYMag, LA Times, the Independent, Business Insider, and others all ran with similarly contrived headlines of how this list will help you combat fake news. Not one of these websites provided a single example of any of the sites on this list reporting anything fake. All they did was promote disinformation (i.e. fake news) by claiming — without researching — that all the sites on this list are fake, because a ‘college professor’ put it together. Don’t get us wrong, we’ve read the list, and some of the sites listed on it are utter rubbish and not to be trusted — even large ones. Also, we are on that list. However, the fact that The Free Thought Project is on this list is no secret as it is several years old and we’ve worn it as a badge of honor since we were first made aware of it. If we weren’t ruffling feathers and being accused (without merit) of being false, then we would be doing it wrong. The truth hurts, and often times, the truth makes those who it exposes furious, and so they take action. Ironically enough, the author of this list admits she gets her information from sites on this list! Some people are asking which news sources I trust, and all I can say is that I read/watch/listen very widely, from mainstream, corporate owned sources (The New York Times, The Washington Post, The Boston Globe, The Wall Street Journal, Forbes) as well as The Atlantic, National Public Radio, and various local and alternative sources with different political perspectives, some of which are included on this list. In a world where 6 mega-corporations own 90% of all the media consumed in America, breaking through the establishment narrative is not an easy task. That 90% is allowed to assert, promote, backup, and perpetuate information that is self-serving, status quo-promoting and, often times, false — without anyone putting them in check. The term propaganda rings melodramatic and exaggerated, but a press that—whether from fear, careerism, or conviction—uncritically recites false government claims and reports them as fact, or treats elected officials with a reverence reserved for royalty, cannot be accurately described as engaged in any other function. This tendency of the mainstream corporate media to perpetuate the two-party system, and only call out corruption when it fits a partisan agenda, has facilitated the rise in peacefully rebellious apolitical sites like The Free Thought Project — whose stated mission is to promote peace and liberty. The difference between sites like ours and the mainstream is that we don’t pretend to be bipartisan and don’t deny being subjective. In fact, we go out of our way to make that agenda clear right off the bat as this helps to understand the information that we are presenting. Pretending to be ‘objective’ while pumping out the day’s talking points handed down from a centralized media establishment, hell-bent on self-preservation and expansion, is hardly ‘real’ journalism. The Free Thought Project is neither right nor left, and we feel that it is our duty to expose the control such a black and white system is able to maintain over its citizens by categorically pitting society against itself. Unfortunately, this truly anti-partisan stance makes us an easy target, not only by the establishment media, but by the alt-right and alt-left as well. The Free Thought Project has been accused of being funded by the right-wing Koch brothers and the left-wing George Soros — within a single post on Facebook. The funny part about this entire ‘fake news’ debacle is that no one cared about it until the most corrupt and criminal establishment candidate in history, Hillary Clinton, lost because of a grassroots movement to expose her connections to the unscrupulous elite. While CNN was telling its viewers that WikiLeaks emails were ‘illegal’ to read, those of us in the alternative media scoured thousands of pages of emails to expose the presidential candidate’s crimes. Even WikiLeaks got pulled into the partisan machine and those who exposed the dirt on Clinton were labeled as pro-Trump and alt-right as a means of discrediting them. However, because we expose all corruption, not just right or left, this discrediting did not work. And, they are using this list which is entirely incomplete and wrong. This highly-promoted list doesn’t even include the huge disinformation sites WhatDoesItMean.com and the EUtimes. While the list does contain mostly right-leaning sites, the left-leaning sites it contains are known for their outspoken support of anti-establishment candidates, like Bernie Sanders. 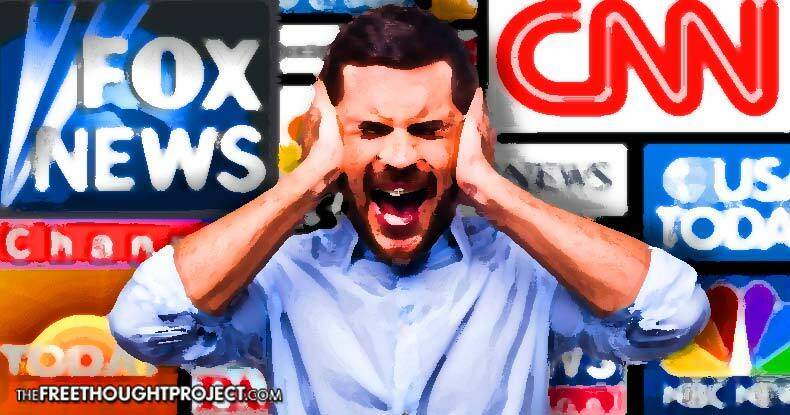 The establishment media is seemingly pitting both sides of the anti-establishment alternative-media against each other — portraying themselves as the only version of ‘truth.’ It seems as though they are attempting to green light the evisceration of grassroots dissent by cutting off the means of information dissemination via Facebook pressure and Google. As the mainstream corporate media calls for silencing those sites who put out ‘fake news’ because they share conspiracy theories and half truths, they are missing (and making) the entire point. Has anyone shown any proof that ‘fake news’ cost Clinton the election? Has anyone come forward and said, “I changed my vote because I read lies on the internet”? While it is undeniable that people will consume and spread false news and unproven conspiracy theories, the very idea that the mainstream media is attempting to silence the fake news conspiracy theorists — with their very own fake news conspiracy theory — would be the ultimate comedic act, if it wasn’t so dangerous. The bottom line is that while some of those sites on that list are disseminating fake news, many of them are not. However, those that are not fake are spreading information that the establishment does not like and does not want its citizens discussing. Instead of simply allowing and trusting in people to use their own judgment when it comes to consuming information online, the establishment is treating us like idiots who are incapable of making their own decisions. The good news is that in reading the comments on all of these mainstream sources who are putting out this list, we can clearly see that the people are not buying it. Nearly every post is overrun with comments exposing their hypocrisy. However, it seems that Orwell’s prophetic Ministry of Truth is finally coming to fruition. Indeed, the status quo’s reaction to their candidate’s loss has provoked a response of which even Stalin would be proud. Please share this story with others who may be succumbing to the establishment’s conspiracy theory about fake news. Hopefully, enough people will stand against this tyranny of thought and this fake news hysteria will be over before it even starts.